HB 2036 dual enrollment; reported information; date (Cook) passed 12-0. ASBA is monitoring. HB 2082 junior reserve officer training; CTE(Blackman) passed 13-0. ASBA is neutral. HB 2186 school meals; unpaid fees (Udall) passed as amended 13-0. ASBA is neutral. HB 2187 appropriation; K-12 rollover (Udall) passed 33-27. ASBA supports. SB 1014 English language learners; instruction; budgeting (Boyer) passed 60-0. ASBA supports. SB 1104 education programs; juvenile detention centers (Carter) passed 30-0. ASBA is neutral. SB 1110 damaged school facilities; replacement; grants (Boyer) passed 30-0. ASBA supports. SB 1111 fine arts proficiency; state seal (Boyer) passed as amended 30-0. ASBA is neutral. 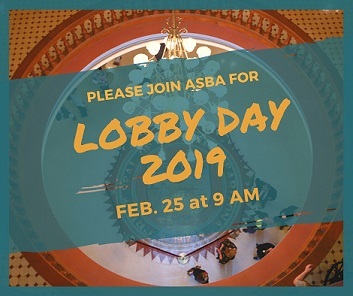 Please join the ASBA GR team for our 2019 Lobby Day! We will have some presentations on advocacy and lobbying techniques, a Q & A session with legislators, and remarks from Kathy Hoffman, Superintendent of Public Instruction. After the House Education committee, attendees are invited to a cocktail reception with High Ground and SOS AZ to mingle with legislators. Sign up to attend Lobby Day here.